Centre for Science and Environment (CSE) is a public interest research and advocacy organisation based in New Delhi. CSE work towards meeting three key challenges: those of driving policy through research and its dissemination; of devising solutions that match the scale of the problems; and of developing capacity ofthose who can implement solutions – both sustainable and equitable, and be the change. Build a cadre of regulators and multipliers in the areas of water and sanitation management through research and capacity building programmes for rapid uptake of innovative techniques and management practices. Develop a global network for sharing of best practices in climate-resilient water management practices. Build capacity of targeted model cities so that they commit to a time-bound plan on sustainable and equitable water provisioning and implement projects on rainwater harvesting. Influence urban project funding to design this change. Help incorporate decentralized and affordable wastewater including septagemanagement in city plans. Recently CSE has also set up the first Faecal Sludge referral lab in India which engages in the FSSM space with end-users, policymakers, practitioners, professionals. The laboratory is a member of the alliance of faecal sludge laboratories anchored at IHE, The Netherlands. 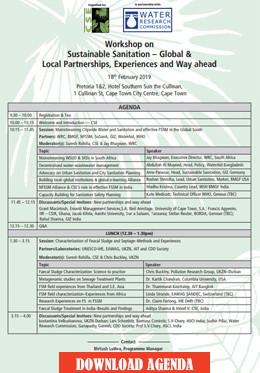 This side event is a knowledge exchange workshop with partners and potential partners or sector players – to learn from experiences, success stories, latest developments and collaboration opportunitiesin mainstreaming citywide water - sanitation and effective faecal and sludge management. The event will include dedicated session of FSM laboratories alliance todiscuss the latest developments in FSSM characterization methodologies, testing protocols and develop further partnerships / collaborations. There is no registration fees for attending the workshop but participation is by invitation only.